Below is what I created last year for my 16ft island. I obviously have reused the same wood tray (that I bought from West Elm a couple of years ago). I also used the same garland again this year. 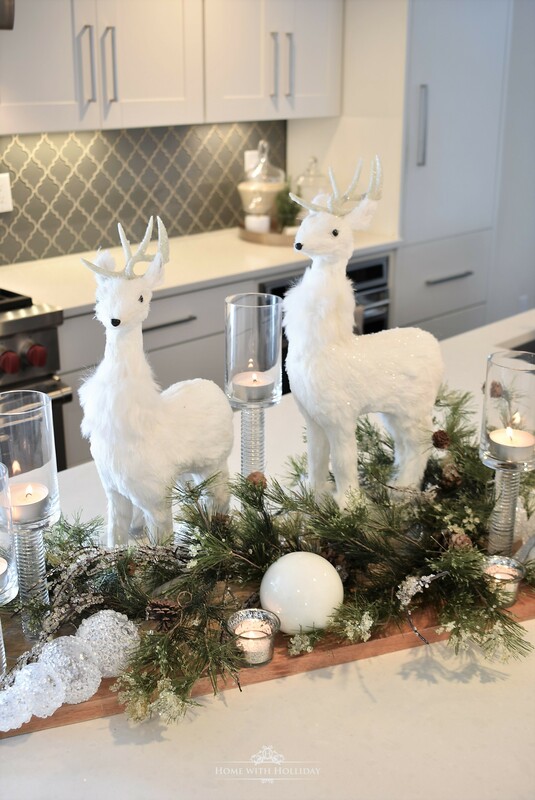 Here is how I used the winter white dear and the white ornaments last year. My island is huge, so I always love using my large wood tray to provide a foundation for my decorations. You could really use any kind of tray. First, I placed the two white deer on the platter, raising the right one with a glass bowl that is upside down. The garland hides this little hack. Second, I wrapped the frosted pine garland around the deer and then placed in the glass stemmed hurricanes. Finally, I added in the white ornaments and votive holders. I love the contrast of the white elements with the garland featured. Isn’t he just so cute tucked in there?! To coordinate with the centerpiece for the island, I put together this tiny, similar look for one of our breakfast room tables. I just used the same pieces that I used inside my apothecary jars last year. Super easy!! Any variety of bottle brush trees would work great! Here you can see how both of the centerpieces work together in our kitchen. Thank you for stopping by today. I would love to hear about how your Christmas decorating is going and what themes and colors you are using this year! Also, check out my “Holliday’s Holiday Gift Guides”!